That's a map of Ireland you are looking at. Admittedly an unfamiliar one. 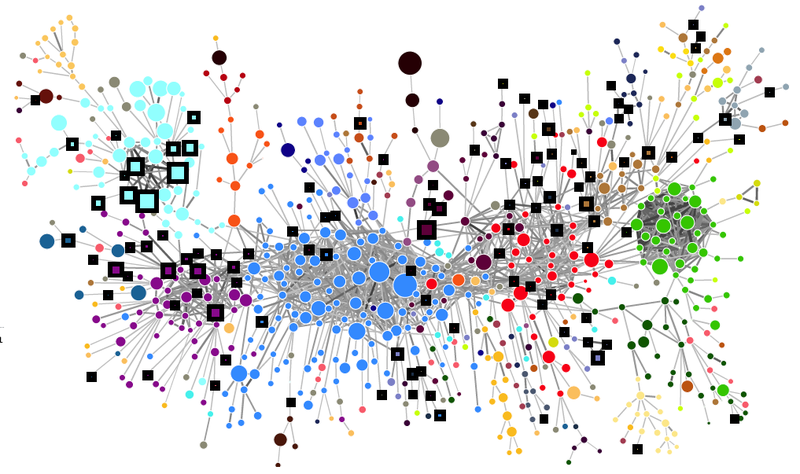 It comes from The Atlas of Economic Complexity - published recently by Harvard Kennedy School. The idea behind the atlas is simple enough: to express the degree of globalisation of countries in terms of Diversity (the number of product markets an individual country is connected to) and Ubiquity (the number of countries connected to an individual product market). Thereafter it gets a bit more complex: but you can enjoy the equations for yourself in the main report. What is interesting is that Ireland scores highly in terms of economic complexity (profile on page 196 of the pdf). We rank number 18 in the world: just below Denmark and just above Israel. Greece ranks number 53 in the world, by the way, just below Brazil and just above Columbia. More fuel for the 'Ireland isn't Greece' meme perhaps? The authors of the Atlas argue that economic complexity is broadly associated with higher standards of living, better growth prospects and a degree more economic resilience. All good things to be sure. Of course, the index is just based on trade-related data. And there's more to an economy and society than exports and imports obviously. Which is why it is handy to compare Ireland's standing in other measures. Luckily we have two new ones to examine. The first is the latest Legatum Prosperity Index for 2011 - Ireland ranks 11th in the world (Greece ranks 40th by the way - just thought I'd mention that). I like the Legatum approach as it combines both economic data and social indicators, including survey based measures of social capital. The second of our comparative measures is the United Nations International Human Development Indicators - just out today. On this measure, Ireland ranks 7th in the world (Greece ranks 29th, in case you are interested). The HDI lacks the depth of the Atlas of Complexity and the breadth of the Legatum Prosperity Index - but as a measure it does provide comparative data going back to the 1980s. And the trend for Ireland has been extremely positive. Of course, all such trends and comparisons must come with the usual warning: past performance is no guarantee of future performance. It seems to me that Ireland is going to need all the complexity, resilience, diversity and ubiquity we can muster in the coming months and years.